It's not long since the winner of online satellite at Intertops Poker / Juicy Stakes poker was off to the Caribbean Poker Tour in St Maarten. Since then they sent a player to compete in the Borgata $1 Million GTD Championship. Now another online player will compete in a live tournament aboard on the Caribbean Poker Cruise to St Thomas and The Bahamas after Christmas. First and second step online satellite tournaments have just begun and continue until this Saturday, December 6. The Final, where the $5000 prize package will be awarded, is on Sunday. The last online player that Intertops/Juicy Stakes sent to a live tournament was eliminated after Day 2 but glad for the experience. 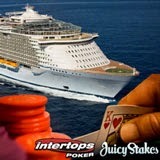 Players can register for Caribbean Poker Tour Satellite Tournaments under the Tournaments tab at either Intertops Poker or Juicy Stakes Poker.